"Motor homes usually have a driver, a passenger, maybe a few kids and at least one dog"
Motor homes usually have a driver, a passenger, maybe a few kids and at least one dog. 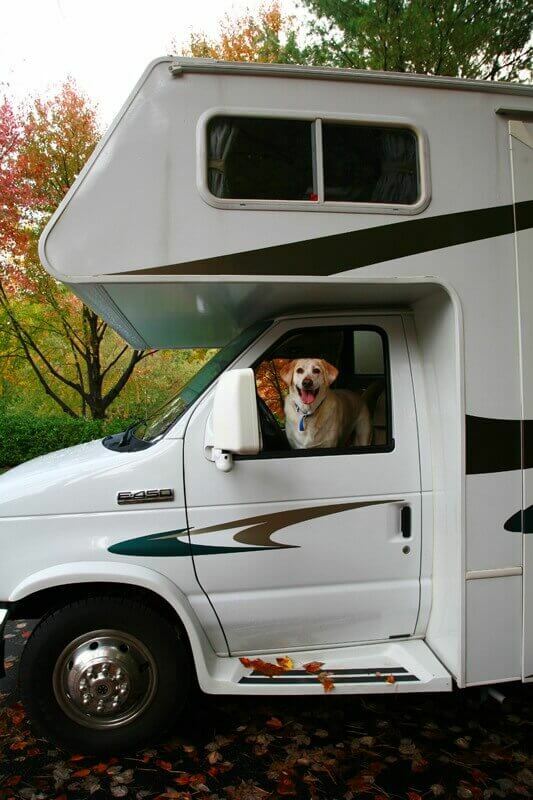 It's a prerequisite that to own a motor home you need at least one dog. Don't be surprised when you see RV dealers matching a breed to a particular model in the future. 1. Keep your dog safe; put his leash on before you open the door. Dogs are excited as soon as their home on the road stops and they want out! But not every place you stop will be safe; on coming traffic, glass on the side of the road, and other dogs near by could cause your dog to run on to the road. 2. Carry a health certificate issued by our veterinarian that clearly identifies the dog and certifies that the dog has been vaccinated against rabies during the preceding 36-month period. This is a must if you plan to travel from the United States to Canada. Different Canadian provinces may have different requirements. Be sure to contact the government of the provinces you plan to visit. It is rare to need the health certificate when traveling in the 48 states but if there is an incident both the certificate and the rabies vaccination certificate could help a bunch. 3. Respect all the rules of campsites and parks. That can mean a special Poop Park or a Dog Run Area and leash rules. You don't want to be asked to move on if your dog misbehaves or is running amuck. Dogs in a new strange place will follow their nose so keep that leash on so he will not get lost. And be prepared to pay extra for your pooch. Some camps and parks have a "dog fee". 4. Always carry poop bags (zip lock sandwich plastic bags for smaller breeds and larger plastic bags for bigger breeds). The trick, using the zip lock bags, is to turn the bag inside out, pick up the poop, turning the bag right side again and zip the contents (and smell) closed. Always try to locate the nearest dumpster or trash can instead of bringing it back into your motor home. 5. D-rings are great! Hook it on his leash and then hook the D-ring to your belt loop. You'll have both hands free. When in camp, tie a long rope to a boulder, picnic table, tree or the bumper of the motor home and tie the other end to the hand rail just outside the RV door. Next time your pooch needs to go out, get his leash, clamp on the D-ring and hook it on the rope and out he goes like a little paratrooper. D-rings make it easy to tie up the dog when you go into a store or shop. Just loop the leash around any post or tree and use the D-ring to secure the dog; this prevents those knots that seem to get tighter by the minute as your dog pulls on the leash. 6. When you go on a tour or shopping and have to leave your pooch in the RV make sure you leave the vents open, have fresh water out, and a few puddle pads on the floor just in case there is an accident. Open windows can become an escape route; right through the screen and a long way down to the ground, so only leave the windows open an inch. 7. The inside of a motor home is usually small and dogs do not get out as much as if they were at home. Brush your dog outside to remove dander, and loose fur, it's much easier to let the wind take it away than to clog up your vacuum. 8. If you're on the road for long periods check the local yellow pages for a dog groomer in the town you are visiting. Or ask at the campground or RV Park for a recommendation of a nearby groomer. A better solution than doggy day care, while you tour a museum or go to a ball game your dog will be pampered and clean when you pick him up. 9. Give your dog a special place, like a dog carrier or a dog pad or bed this provides him with a secure and comfortable place when he is feeling scared or tired. 10. If your dog gets nervous or anxious while traveling try Dramamine™ and St. John's Wort. Ask your vet for the amounts to be given based on your pooch's body weight. Dogs enrich our lives in everyway and they deserve a road trip too. Besides, they're a lot easier than kids and dogs don't keep saying over and over "Are we there yet?" or "where's McDonalds?" The only draw back, dogs can't use the bathroom so they compel us to "stop and smell the roses" every so often. Genevieve Frederick is the Publisher at Paw Publishing, Inc. The newest title "Happy Tails: Hilariously Helpful Hints for Dog Owners," is a rib-tickling look at why we both love and are puzzled by our four-footed friends by Dr. Gary L. Ailes.